The Farquhar College of Arts and Sciences Division of Humanities welcomed Sister Helen Prejean, CSJ, to Nova Southeastern University as part of the college's Distinguished Speakers Series. 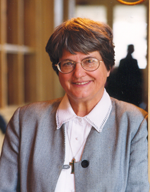 Born in 1939 in Baton Rouge, Louisiana, Sister Helen Prejean joined the Sisters of St. Joseph of Medaille in 1957. She began her prison ministry in 1981 when she became pen pals with Patrick Sonnier, a convicted murderer who was sentenced to die in the electric chair of Louisiana's Angola State Prison. Upon Sonnier's request, Sister Helen repeatedly visited him as his spiritual advisor. In doing so, her eyes were opened to the Louisiana execution process. Sister Helen's 1993 book about her experiences, Dead Man Walking: An Eyewitness Account of the Death Penalty in the United States, was number one on the New York Times Best Seller List for 31 weeks and was nominated for a Pulitzer Prize. It was also an international best seller and has been translated into 10 different languages. Dead Man Walking was adapted into a 1996 motion picture written and directed by Tim Robbins and starring Susan Sarandon as Sister Helen and Sean Penn as a death row inmate. The book was also the basis for an opera, with a libretto written by Terrance McNally and music composed by Jake Heggie that premiered in 2000 with the San Francisco Opera. In 2002, Tim Robbins wrote a stage version as part of the Dead Man Walking School Theatre Project, affiliated with the New Orleans-based Death Penalty Discourse Network, where Sister Helen bases much of her work. More than 170 U.S. high schools, colleges, and universities have produced the play as part of the project's mission to inspire education and discussion about the death penalty. The Farquhar College of Arts and Sciences Division of Performing and Visual Arts presented Tim Robbins' Dead Man Walking, from April 17-26, 2009, in the Performance Theatre in the Performing and Visual Arts Wing of the Don Taft University Center. Sister Helen has become one of the most visible, leading activists in the fight to abolish the death penalty in the United States. Her second book, The Death of Innocents: An Eyewitness Account of Wrongful Executions, was published in 2004 and she continues to educate the public about the death penalty by lecturing, organizing, and writing. Her visit to Nova Southeastern University corresponded with the Farquhar College of Arts and Sciences' 2008-2009 academic theme of "Life and Death," which brought together the college's students and faculty to explore the relationship of life and death within social, scientific, legal, religious, and political contexts.